Oh yes I did. My oldest turned 13 today and he wanted crepes for breakfast. No problem. Here is the deal with coconut flour. The package clearly says that it can be substituted for up to 1/3 of the flour called for in a traditional recipe. Well, I knew that wouldn't work because the crepe batter would be way too thin, so the only other option was to increase the egg. Most crepe batters also call for some oil, but it still came out to runny. Believe me, I tried just doing a normal adaptation from my favorite crepe recipe in Cooks Illustrated, but it was a huge miss. It call for water too, but that was still too runny. I tried almond and coconut milk from a container, again too runny. Somehow, after 4 cups of crepe batter, this is what I came up with and it works. Whisk eggs, milk, and flour well. As noted above, if you need more coconut milk to make the batter the perfect consistency, add a little at a time. Heat crepe pan and lightly oil with coconut oil. Pour in enough for a thin coat. Cook until it starts to puff a bit and sets up, around 2-3 minutes depending on the size of the pan. Turn over and cook an additional minute. I choose to use grass fed dairy. So therefore, I am not a STRICT paleo follower. Once of the great things about eating real, good foods is that if you can be moderate, you can enjoy everything. Heat berries until they start to release moisture and allow them to cook down a bit. Add honey and allow it to melt and mix well. 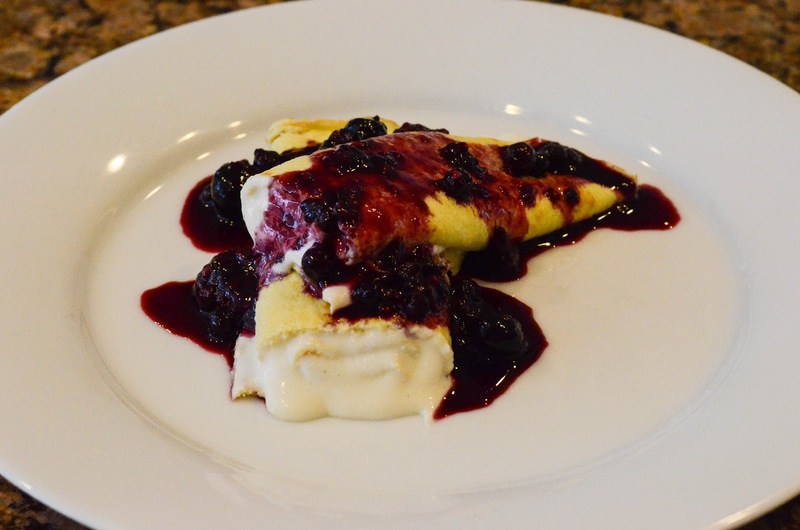 Place crepe on a plate and put in a couple of tablespoons of the ricotta mixture. Roll and then set aside on a sheet pan in a warm oven until you are done with all of the crepes. Since I had to make this mix for 6 people (the recipe for the crepes can be double, tripled...whatever you need). Otherwise, if you are just making it for you put a plate in the oven to warm them. Top with the berry mixture and enjoy!